If you’ve been following my Instagram, you’ll know how insanely obsessed with the classic favorite Everything Bagel [ahhhhh *angels sing*] that I currently am. 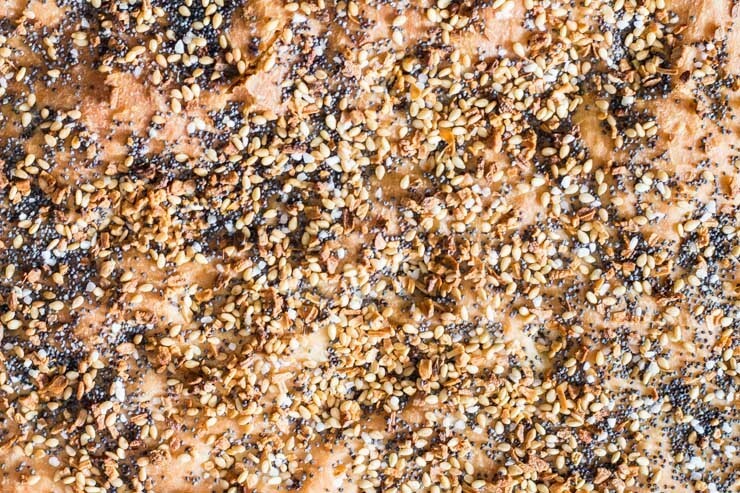 Something about that garlic, onion, poppy, sesame, salt blend that just hits the spot. 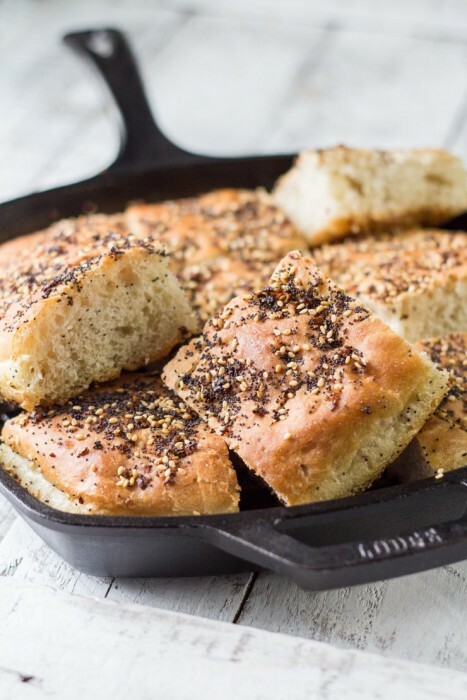 I decided to bump things up a bit and see what else would taste amazing with this magical blend on top– Everything Bagel Focaccia Bread was the result. And it. was. perfect. I really struggled with what exactly I would do for this topping mix. As many bakeries do, I considered blending my own unique “everything” mix together to make the post that much more unique. 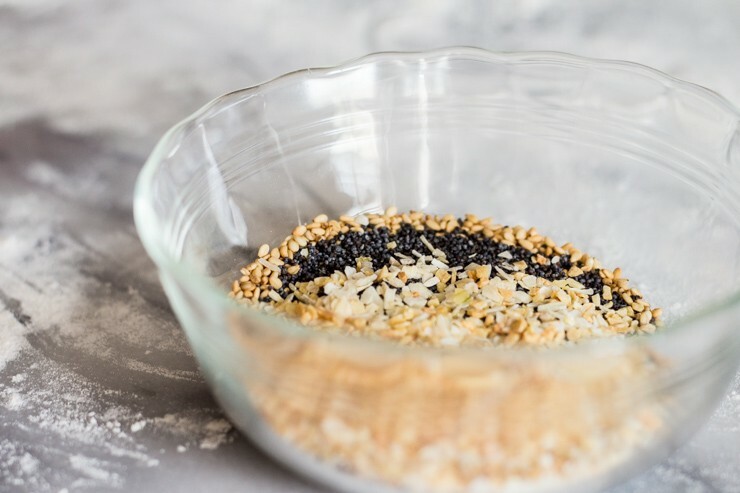 I threw in some common spice cabinet additions– celery seed, various salts, and even some odd additions. All of the varieties were just fine. Fine? Fine, I said. Fine isn’t good enough. I kept trying to compare the twists with the classic blend. While jalapeño everything bagel topping may come another day, as I’m convinced it would be badass on a pizza, today isn’t that day. Back to the basics– classic everything bagel topping it is. Focaccia is one of those recipes that I have taken for granted. It’s something I’ve eaten plenty of, made a few plain ones in the past, but haven’t really experimented with in the kitchen (until now). I guess I got distracted by all of the sugar and butter… Imagine that. If you look closely enough, you’ll find Waldo in there. Waldo eating every single bit of the perfectly blended garlic, onion, poppy, sesame and salt, I mean. Look at that. Puffy like a classy pillow, tan like a retired Floridian snowbird, heavily coated with seasoning. This focaccia knows what it’s got going on. I would say that it would make for the absolute best office take-in treat evahhh, except you aren’t going to want to share this with anyone. Close the windows. Don’t let the neighbors smell this one at all. They probably didn’t cut their grass on time anyway. They don’t deserve it. It’s juuuust fine. I baked this in a cast iron grill skillet. It gave the focaccia that much more texture by leaving it with nice ridges on the bottom side. Plus, the pan was $20. Seriously. Getchya one. Y’all know my feelings on cast iron. Now… I have to confess that I literally ate 2 pieces of this stuff straight out of the oven. With my mitts still on because it was too hot to handle otherwise. I couldn’t help it. At that point, my house smelled like a busy bakery and I just had a natural instinct to call dibs on whatever I could get my hands on before it ran out. Once I realized that my doors were indeed locked and nobody was in a line behind me waiting (yet), I slowed my roll a bit and went for the obvious– cream cheese (basically a food group in my place). Just FYI… This was absolutely the best choice. 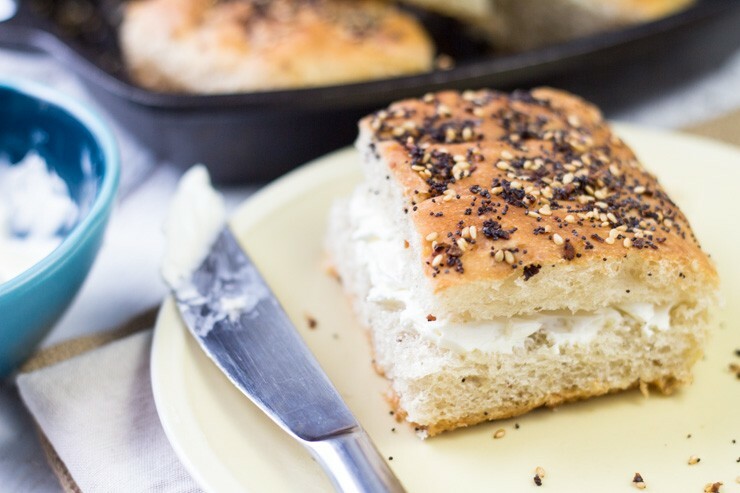 Warm, light focaccia with the whipped cream cheese. 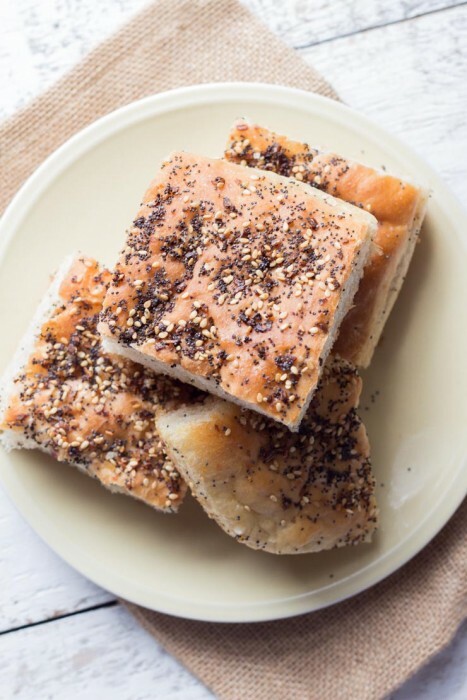 It’s like everything that you ever wanted in an everything bagel-esque everything foccaccia. 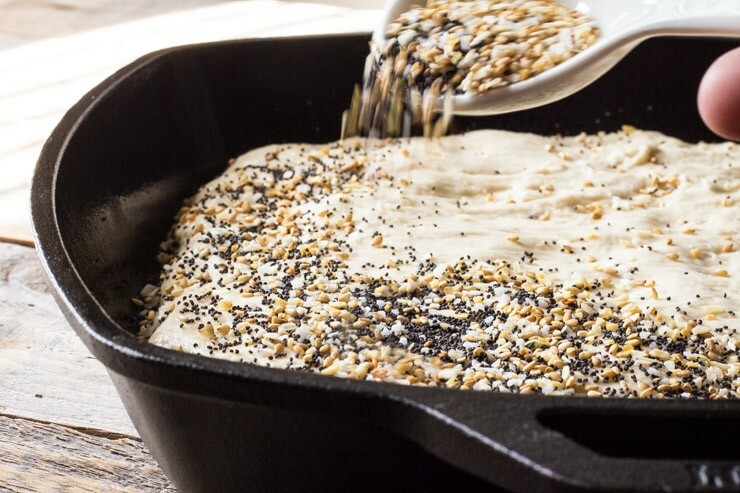 A nice variation from the norm (although, I promise to never abandon the classic favorite bagel), this insanely easy bread is sure to rise to the top of your go-to bakes list. 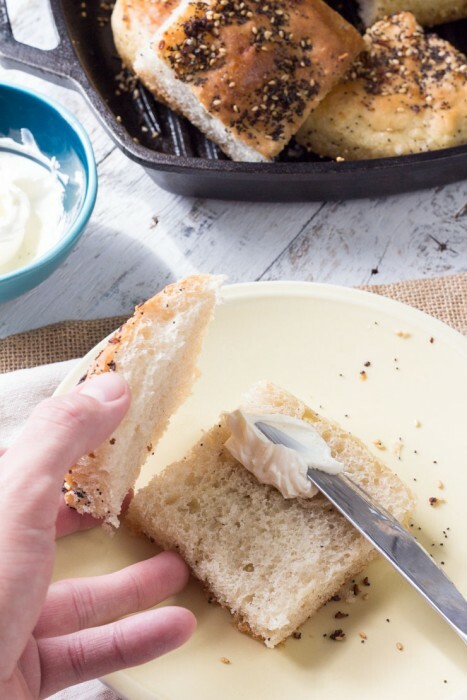 Everything that you want from an Everything Bagel in an Everything Bagel Focaccia Bread recipe. 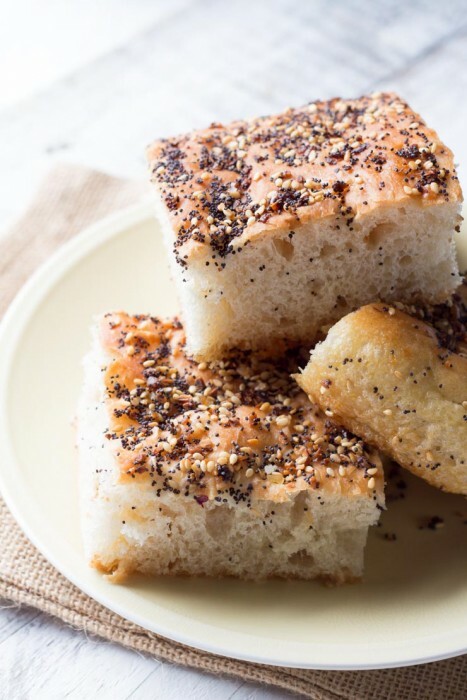 Garlic, salt, poppy seed, onion, sesame on light focaccia. From SouthernFATTY.com. Add the entire starter, olive oil, almond flour, bread flour, honey, salt, garlic, onion powder and mix slowly until combined. Mix on medium speed with dough hook for 6 minutes. Brush top with olive oil. Cover with plastic wrap or damp kitchen towel and let rise for another hour. Press small dimples around the dough randomly. Be light. You don't want it to deflate. Goes well with cream cheese! Favorite bagel? Let us know below! 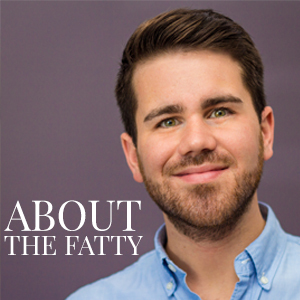 “Puffy like a classy pillow, tan like a retired Floridian snowbird.” Love it. Also, this looks SO GOOD. I need to try foccacia! I sorta questioned whether describing food as a skin tone was a good idea. Only live once, right?! 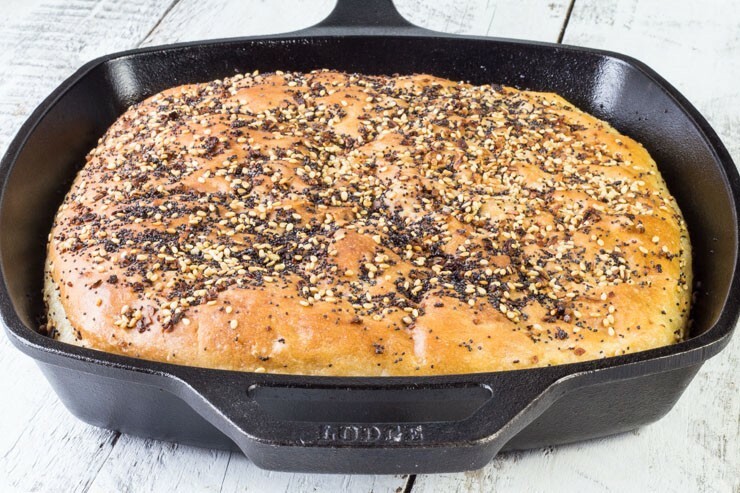 Focaccia is sooo easy and sooo good! This looks so delicious. I too am an everything bagel aficionado. I used to work at a bagel shop and it was the best thing ever. Gonna have to make this! They’re sooooo good! I’m a garlic addict, though. Damnnnn your bread game is ON POINT. This is amazing!